Thank you for making a pledge to The Fly Club supports Roxbury Youth. We will notify you by email when the fundraiser is launched! Come and hear great music while supporting a great cause! Help us to put instruments into the hands of inner city youth! to endorse David France's fundraiser for Revolution of Hope. Join us on Friday April 3rd at 7:30 as we enjoy a night of great music in support of The Roxbury Youth Orchestra! Hear 3 Great music groups! Thank you for joining the Fly Club in supporting The Roxbury Youth Orhcestra's mission to transform the lives of inner city youth through the music. We believe that the intersection of innovation, community, and the arts can catalyze social change and propel economic growth in a city. 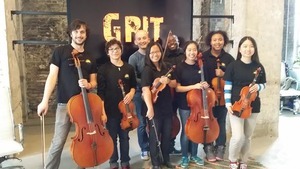 This belief compelled us to launch The Roxbury Youth Orchestra an intensive joy-filled conservatory-level music program with the social goal of impacting young lives through music. Far too often we have become satisfied with giving second hand opportunities to inner city kids and then wonder why we don't receive better outcomes. We believe that the degree of the change is directly related to the quality of the investment. Therefore we have brought world-class instruction to the 'hood in a really fun and supportive atmosphere that promotes pro-social behavior and builds community. The arts is a more relevant bridge to build discipline, encourage team work, and is a canvas for creativity. This program gives inner city kids access to a safe place after school where they can make friends and express themselves. Your donation helps to put an instrument into the hands of more kids! Thank you for you for being a part of The Fly Clubs efforts to generously support inner city youth and keep this program going! Raised of a $2,000 goal. Endorse David France's fundraiser for Revolution of Hope. Log In or Create An Account to endorse David France's fundraiser for Revolution of Hope. Pledge to "The Fly Club supports Roxbury Youth"
Donate to "The Fly Club supports Roxbury Youth"